They stare at me while i.. crave you. i've been drowned in hecticness recently, and, to be honest, i am quite enjoying that kind of situation. if you know me well enough, you'll see that there are no way this talkative, hyperactive, fat-but-not-realizing-the-fact boy is going to settle down a bit for a midday chat, unless i'm very very 'empty'. thanks to one of my friend who tweeted abt her wanting to blog earlier, i finally connect my lame computer to my other lame modem and super lame internet provider. sitting here in my room, a boxered-boy sipping a cup of hot tea, writing these. Now. what the heck with the title? maybe some of you have heard a song called 'crave you' by flight facilities, and maybe some others havent. honestly, ive been listening this song a couple of times before, but i havent really really pay attention to the words in it. until yesterday. and OH MY GOD i love it. so here's the deal, please read the lyrics while thinking of you (if you're a girl) and of a girl you adore (in case you're a boy). sounds familiar? :D i can't stop my mind from wandering around. you see, i had some experiences that involves 'girls' and 'crushes'. we all know where it's going to lead right? i mean me (and probably 90% of other boys) got our eyes struck on a girl, a fascinating girl who had a beautiful smile, or beautiful hair, or whatever. we adore her appearance. we got the sense of feelings that something is gonna come out from our tummy, and we're pretty sure it's not that crappy burgers that we ate for lunch. i avoid that 4-letters word. save it for the last. i prefer to describe it as "Cliche Repetition of Unnecessary Symptoms in Heart', which lead us back to.. crush. yep, we all did, we all did. and all i tried is being nice to the girl, asked her politely, sneaked across her just to see her face, texted her, bla bla bla. and what i got in the end? not far from 'sorry' and 'buhbye'. LMAO. but those experiences told me few things, some theories that i haven't proved yet... until i heard this song. and more importantly, pretty girls love boys that.. not into her at all. and for you boys.. a sentence: dont.be.too.obvious! 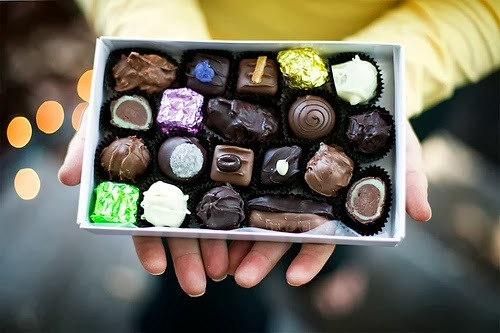 love is also like a box of chocolate. you'll never know what you gonna get.